PHOENIX — In the face of teacher strikes that have forced the closure of hundreds of public schools and displaced more than 800,000 students in a fight over funding for K-12 education, Arizona lawmakers are speeding toward passage of a budget that will provide $7.5 million to two state universities for so-called “freedom schools” designed to teach conservative values. Since 2016, legislators have appropriated $12 million to Arizona State University and University of Arizona for these ideologically driven centers, which previously had been funded by the Charles Koch Foundation. An AZCIR examination of the spending at the two universities shows that the schools still have $9.8 million of that money on hand. Neither university has asked for any of the funding for the freedom schools. Eventually, conservatives struck upon a way to push back against what they see as a rising tide of political correctness and liberal indoctrination: fund oases of conservative thought and scholarly research on those same campuses. The billionaire libertarian Koch brothers and their affiliates have been funneling money to colleges and universities across the country to do exactly that since the 1980s. The strategy, critics say, is to fund private institutes where the Kochs and their affiliates could support faculty whose ideology matched theirs. But Arizona lawmakers turned that model on its head in 2016, when they inserted a $5 million line item into the state budget for “economic freedom schools” at Arizona State University and University of Arizona. ASU received $3 million and the other $2 million went to U of A.
ASU was home to two existing centers that had previously been funded by Koch Foundation gifts since 2010, the Center for Political Thought and Leadership and the Center for the Study of Economic Liberty, while U of A had received Koch money operate and expand the Center for the Philosophy of Freedom. The three existing centers, which had published research papers on small-government policies like ending Arizona’s income tax and eliminating public K-12 schools, would now be given millions of taxpayer dollars to expand their reach and scope. A year later, and despite millions of dollars from the prior year’s appropriation going unspent, lawmakers added an additional $1 million to each university for the “freedom schools,” bringing the annual state appropriation to $7 million for the current fiscal year. Arizona State University used its $3 million appropriation in 2016 to create the School of Civic and Economic Thought and Leadership to house the two existing centers. In creating a new school, ASU announced it would create a new major and curriculum built on the “great books” and texts that serve as the basis for western civilization. Undergraduate students in the new major are anticipated in the fall of 2018, with the graduate program opening for enrollment in fall 2019. U of A created the Department of Political Economy & Moral Science, which houses the Center for the Philosophy of Freedom. Currently, the center is a research unit of the philosophy department and offers no curriculum. The new department will offer undergraduate and graduate degrees. Both universities have banked much of the money given to them by lawmakers for future use, though it’s unclear what it will be spent on or when. ASU is on track to spend about $2 million of its $4 million appropriation in the current year, fiscal year 2018. 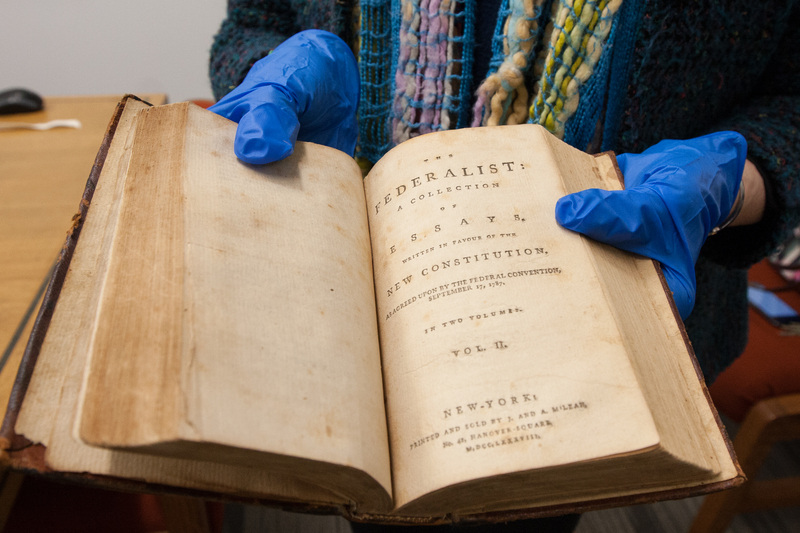 About half of the expenses are for faculty and staff, though the School of Civic and Economic Thought and Leadership has garnered media attention for purchasing a first-edition copy of “The Federalist Papers” from 1788 and paying for its students to take a 10-day trip to India over spring break. 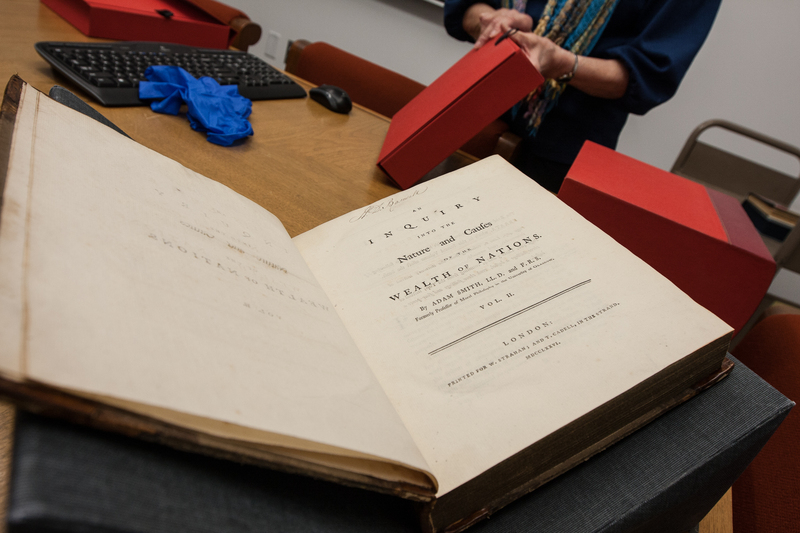 The school has since purchased an early printing of George Washington’s “Farewell Address” from 1796, an autographed copy of a book by the Rev. Dr. Martin Luther King, Jr, and a first printing of Adam Smith’s “The Wealth of Nations” from 1776. The total cost for the rare publications is estimated to be $430,000. All of the items are stored in ASU’s Hayden Library and can only be viewed by appointment or at special events. In all, when the current fiscal year ends in June, ASU projects it will have $4.25 million remaining of the $7 milion it has received from the Arizona Legislature. Likewise, U of A’s Department of Political Economy & Moral Science has been able to save much of its appropriation for later use. The university has received $5 million in state funds thus far over the two fiscal years, which was supplemented by about $2.5 million in other funds. At the end of this fiscal year, it expects to have a balance of more than $5.5 million to spend in future years. In the case of both universities, the amount saved is more than what has been spent in two years. To critics, the continued funding of the “freedom schools” stands as a monument to the hypocrisy of small-government Republican lawmakers who championed deep cuts to Arizona’s K-12 and higher education system during the Great Recession and the years that followed. But to those lawmakers, and the professors who are on the receiving end of those appropriations, the schools present an opportunity to both teach students about the principles that helped shape the creation of the United States of America and serve as a place where civil discourse is held in esteem – an island of elevated, if sometimes blunt, discussion in an academic sea of safe spaces. Senate Appropriations Committee Chairman John Kavanagh, R-Fountain Hills, called the money for the freedom schools “very special” because it provides a needed balance on the ASU and U of A campuses. For many, evidence of the decline of civil discourse on college campuses can be seen in the student-led protests against controversial speakers – most often conservatives – invited to campuses across the country. From Ben Shapiro to Milo Yiannopoulos to Richard Spencer to Charles Murray, all of whom are recognized as provocative conservatives with contentious opinions, American universities have been the site of public, and often violent, student protests against speakers whose views run counter to the liberal positions held by many college students. Zachary German, a political science professor at ASU’s School of Civic and Economic Thought and Leadership, sees two main reasons why civil discourse on campus, whether in a classroom setting or involving guest speakers, is endangered. First, we live in a highly polarized political climate. Majorities in each of the major parties hold very unfavorable views of the opposing party. A 2016 poll by Pew Research Center found more than half of Democrats (55 percent) and nearly half of Republicans (49 percent) say they are “afraid” of the other party. Second, research shows students are increasingly hostile to the idea of even listening to opposing viewpoints. A 2017 survey of college students by the Brookings Institution found that 51 percent believe it’s appropriate to snuff out a controversial speaker by “loudly and repeatedly shouting so that the audience cannot hear” the speaker. That view was held by 62 percent of Democratic students, compared to only 39 percent of Republican students. And one-in-five students – there were no statistically significant differences in response by political party affiliation – said it was acceptable to use violence to disrupt a controversial speaker. In a 2016 poll, 27 percent of college students said their schools should be able to restrict the expression of potentially offensive views. Rep. Paul Boyer, a Phoenix Republican and chairman of the House Education Committee, said the freedom schools are increasing speech and critical thought on their campuses. “I think they embody what should be done at the university level,” he said. “You find someone who is the best on free speech – that’s what they’ve been doing lately – or on whatever the issue is, left and right, and let’s bring them in and have them talk. Devin Browne and Evan Wyloge contributed to this report.